One of my most favorite things about living in the city is walking past the fragrant flower displays at corner bodegas. I can never resist picking up a bright bouquet for myself or my loved ones. Self care is essential these days, and for me it’s splurging on overpriced candles and fresh flowers. I’ve always equated blooming flowers to a happy home or a celebration of sorts. 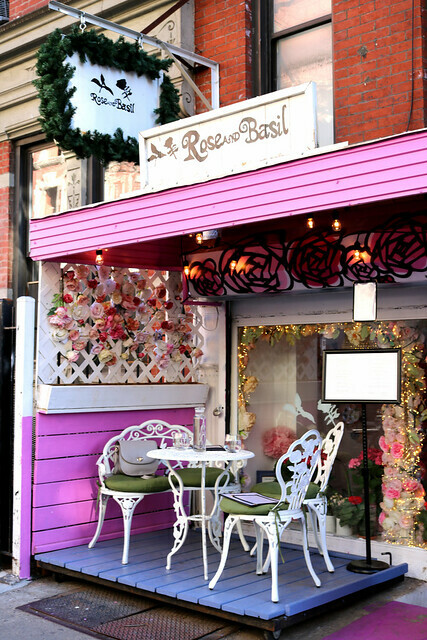 Rose & Basil is one place that takes their flowers seriously. It was the perfect excuse for a playful afternoon to enjoy floral-infused cocktails and cakes in the East Village. Thankfully the weather was cooperating for us to enjoy the patio. The pink exterior is picture perfect with an outdoor table nestled under a bouquet of seasonal lights and flowers. I love people watching when I’m dining al fresco, unfortunately this time it was quite the opposite. Our pretty little setup attracted more attention than we had asked for. Drinks were in order. I decided to try the flower bubble. The prosecco based cocktail comes with your choice for a flower infusion, with options like rose, lavender, elderflower ,and orange blossom to choose from. I opted for the lavender. 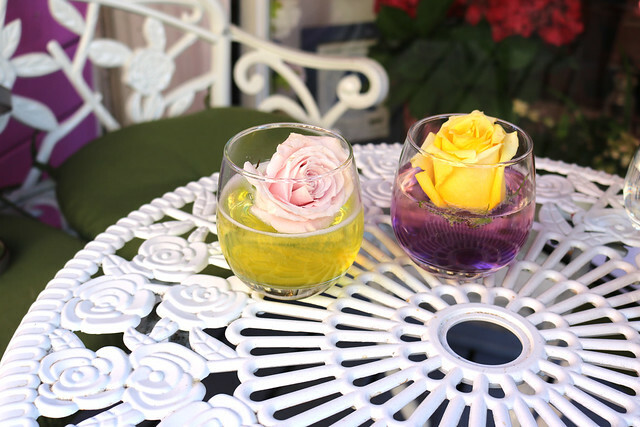 The sparkling purple cocktail is served with a bright yellow rose for added flair. It was delicious and tasted fresh. The ultra violet cocktail totally hit Pantone’s color of the year. Pallavi chose a flower bubble as well and decided to try the elderflower infusion. The chartreuse cocktail was served with a blush pink rose for contrast. Essentially everything served is decorated with a fresh rose or seasonal flower. I was pleasantly surprised to find that the flowers in our cocktails did not distract or get in the way as we took sips. 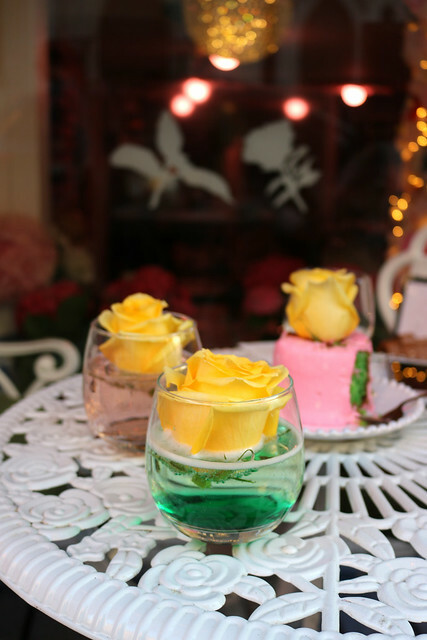 The cakes at Rose & Basil looked especially stunning…almost too stunning to eat. There are so many unique options for mini cakes, ranging from lavender and chocolate to smore’s, cherry blossom, and rum cake with almond and ricotta. The floral flavors and unique seasonal ingredients are truly built into the experience. The cakes serve about 2-3 people and priced affordably at $11. It only seemed appropriate for us to go with the classic rose and basil cake. The vanilla and passionfruit sponge cake is filled with rich Italian meringue rose buttercream. The bubblegum pink cake is frosted with rose petal pastry cream. 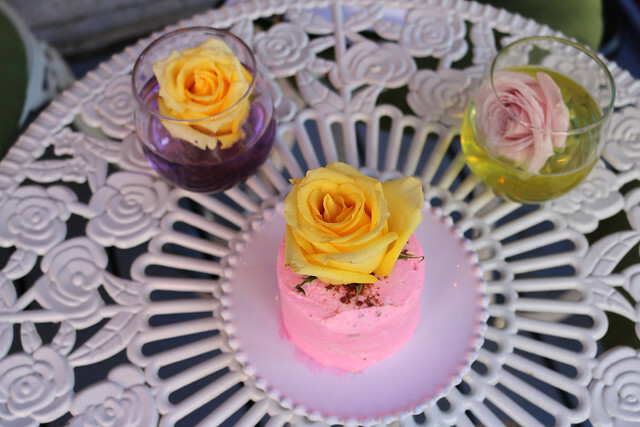 While the cake is pink on the outside and topped with a pretty yellow rose, the inside is bright green for basil. We were eager to dig into the cake. The cake was unbelievable. Pallavi and I felt guilty for deconstructing how beautiful it was. For our next round of cocktails, Pallavi opted for an orange blossom flower bubble. We were a bit confused as it was served in an unlikely color. The cocktail did have citrus notes despite being emerald. I chose the mimorose for a subtle cocktail. The mimorose is a twist on a mimosa with prosecco and rose lemonade. Both of our cocktails came with beautiful roses as we expected. We had a lovely time catching up over cocktails at Rose & Basil. We’d say it’s the perfect little spot for you and your gal pals to retreat to and turn into an Instagram worthy afternoon.